Toms Duct Repair Cranbourne provides you quality Duct repair, installation, insulation and Duct Replacement services with guaranteed result. Call us today on 1300 068 194 for same day duct servicing. Even if you have the type of home comfort system that makes use of ducts to distribute heated and cooled air throughout your house, you probably do not think about them much. After all, ducts are ducts and you spent way more time and energy deciding what type of furnace, heat pump or air conditioning system to put in. The ducts were simply a part of the package. But the integrity of the ducts in your house can actually have a huge impact on the ability of your comfort system to effectively cool or heat your home. And if you start noticing a drop off in the quality or effectiveness of your heating or cooling system, there is a good chance your ducts have something to do with it. And even if you do not notice a change in the performance of your system, there could be leaks or cracks in your ducts that are causing your heating and cooling costs to increase. In order to make sure that you are getting the most possible out of your home heating and cooling systems, call the professionals at Toms Duct Repair Cranbourne today to find out more about our duct repair services. The symptoms of a duct problem are many and varied. In many cases, you are likely to assume that the problem originated with your heating and cooling unit itself. And while that is certainly a possibility, your problem could just as easily be originating in your ductwork. So what types of problems are we talking about? Well, for one thing, if you start to notice that your home comfort system seems to be heating or cooling your house unevenly, it is time to call for repairs. Whether the problem lies in your ducts or with your system itself, you will need a professional to come out and remedy the situation. Also, a sudden drop off in the overall effectiveness of your home comfort system can indicate that there is something wrong that may very well be related to the state of your ducts. You should also keep an eye on your monthly energy bill to see if you notice a sudden increase in the cost of keeping your house at a comfortable temperature. If you do, it may be time to call in a duct repair person to take a look at your ducts. Regardless of what you think the problem is, it’s important that you call for professional service right away. Letting issues like this persist will only lead to more problems down the line, potentially costing you even more later on. Sealing your ducts is the most effective way to help resolve issues of hot and cold rooms in the home along with temperature fluctuations throughout the home. If you are having problems with air not reaching certain rooms of your home, you may need to consider duct replacement. For that contact experts at Toms Duct Cleaning. Adding ducts to your home is only one part of a larger project to upgrade your home’s heating and cooling system. 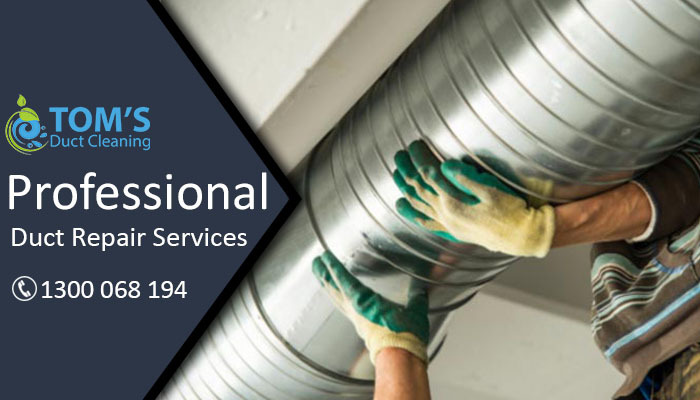 We are best Duct Installation Service Providers. A professional dryer vent repairing from Toms Duct Repair will help your dryer perform at peak efficiency, which can save money on energy bills. The average home improvement enthusiast can relocate the duct, call the professionals at Toms Duct Repair Cranbourne today. Toms Duct Repair provides the best Duct Insulation service in Melbourne, Sydney and Brisbane. Carbon monoxide is a gas that is created when fossil fuel (example: natural gas) is partially burned. When we inhale carbon monoxide our bodies are fooled into thinking that it’s oxygen so our natural alert system, the gasp for air, is short circuited. The lack of oxygen makes us drowsy and can lead to a very unfortunate outcome. Carbon monoxide has been known as the invisible killer because of it’s colorless, odorless, tasteless toxic gas. Without proper ventilation carbon monoxide can basically turn your home into a ticking time bomb. One of the reasons that carbon monoxide poisoning is on the rise is that new homes are built to such high energy standards that they don’t “breathe.” That is to say, there is very little air transfer between the interior and exterior especially if your homes air ducts have not received the proper maintenance, so bad gases are trapped indoors. We have certified Duct Testing team. Our team can determine whether the levels of exhaust gases are safe, and whether they are being properly vented up the chimney. We can recommend the correct repair to return the appliance to safe and efficient operation. The experienced technicians at Toms Duct Carbon Monoxide Testing are dedicated to providing quality air duct Carbon Monoxide Testing and maintaining your air conditioning & heating units. Dedicated to a healthier air environment, the team at Toms Duct Cleaning Melbourne provides free estimates and will explain exactly what you need, why you should consider it, and how it will help to maintain cleaner, healthier living.